12 Cool Facts About Cable Ties! Next to duct tape, the cable tie is one of the handiest things to have in your toolbox. In addition to bundling groups of wire they are used as emergency fasteners, to secure products in packaging, hanging Christmas lights, and are even used in arts and crafts (try searching google images for “cable tie lamp shade” or “cable tie fashion”). 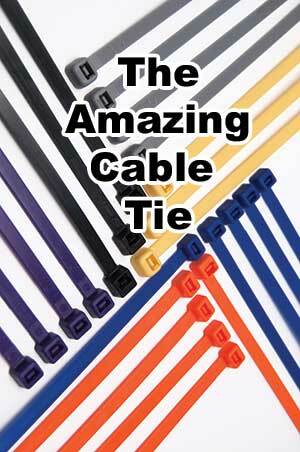 Here are 12 cool facts you might not know about the amazing cable tie. Cable ties are known by many different names including zip tie, wire tie, zipper tie, wire wrap, hose tie, rat belt, mouse belt, and the original brand name Ty-Rap. They can be reused. Yes, even the ones not specifically designed to be re-useable. Just slide something under the jaw that engages the grooves of the tie – like a fine screwdriver or needle. Sometimes the jaw can even be pulled back from the teeth with a fingernail. Of course the tie may not be as strong on the next use. Black is the best color if used where the cable tie will be exposed to sunlight. The black carbon additive used to achieve the color also provides UV protection. Cable ties are not all the same. Ties from different manufacturers can vary greatly in strength - even if they are the same length, width and color. For critical applications, check the tensile strength rating and be wary of ties that are old or have been exposed to sunlight for extended periods. Avoid no-name ties sold at discount stores. Cable ties were invented by an engineer at Thomas & Betts in 1958. They were originally marketed under the name Ty-Rap. Previous to the invention of cable ties, nylon cord was tied around bundles of wire – a process that was tedious and hard on the hands of workers. If nylon cable ties aren’t strong or durable enough for your application, there are metal versions available. Metal cable ties have the additional benefit of being flame proof. If your cable tie is too short, you can join two together. Just insert the tapered end of one into the jaw of the other until it engages the teeth. Clip the excess ‘tail’ and now you have a longer tie! The original design was two pieces and had a metal ‘jaw’ or pawl that engaged the teeth of the strap. Nail clippers are excellent for cutting cable ties and reduce the risk of injury. If nail clippers are not available, wire cutters should be used. If you must use a knife, don’t saw at the tie (can damage what it is tying), or put the knife under the tie and cut by pulling towards you. Specialty cable ties are used by law enforcement as a substitute for handcuffs. They are used in particular with large volume arrests (protests and riots for example). They have the benefit of being disposable so there is no risk of transferring germs from multiple uses. Billions of cable ties are produced yearly, with some estimates as high as 100 billion. They are manufactured by more than 45 companies worldwide. Many are used as a temporary attachment. It is estimated 70-80% are in use for less than one year.